Vancouver, B.C. Qualex-Landmark™ announced today that it has received final approval from the City of North Vancouver and will be preparing to launch its $100 million condominium and townhouse project, Green on Queensbury. Green on Queensbury is the newest addition to the Qualex-Landmark™ group’s portfolio of award-winning communities. Spanning the entire 700 block of East 3rd Street at the foot of Queensbury Avenue, Green on Queensbury is comprised of three 4-storey buildings uniquely located on Moodyville Park. The project is targeting LEED Gold for Homes Multi-family Midrise, and includes apartment condos, garden homes and park-fronting townhomes that will range in size from roughly 550 to 1,500 sq.ft. with sales launch anticipated in September, 2017. “As the only large scale parkside residential community in Moodyville, we are very excited to contribute our part to help revitalize the neighbourhood. We’re also delighted to be back on the North Shore on the heels of our previous success, District Crossing residential community, on Marine Drive in North Vancouver,” says Mohammed Esfahani, president, Qualex-Landmark™. Green on Queensbury stands alone as the first fully parkside residential development in the soon-to-be revitalized Moodyville neighbourhood. Over the course of two years, the City of North Vancouver, with extensive input from the community, developed new design guidelines and land use regulations for the area. These will result in the creation of a mix of housing options, creation of sustainable energy efficient buildings, improved greenways and transit networks, and significant enhancements to the character of the neighbourhood. Lonsdale Energy Corp. (LEC) will also extend its district energy system into Moodyville, providing future residents with sustainable thermal energy. The revitalization of the Moodyville neighbourhood and Park fits with current market trends. According to RE/MAX’s 2017 Spring Market Trends Report, 66 per cent of Canadians feel like location is more important than style or size of a home, and 77 per cent of Canadians feel access to green spaces and parks is important. Green on Queensbury will generate a cash amenity contribution of over $4 million dollars. Over $2.5 million would be dedicated to the Moodyville Parks Master Planning process and to park improvements that will re-establish Moodyville Park as a vibrant community amenity on the North Shore. Mayor and Council are scheduled to review the draft Moodyville Park Master Plan concept soon and, if approved, construction could commence as early as spring 2018. Residential property sales in Metro Vancouver have increased by 22.8 per cent in May 2017 compared to April 2017. 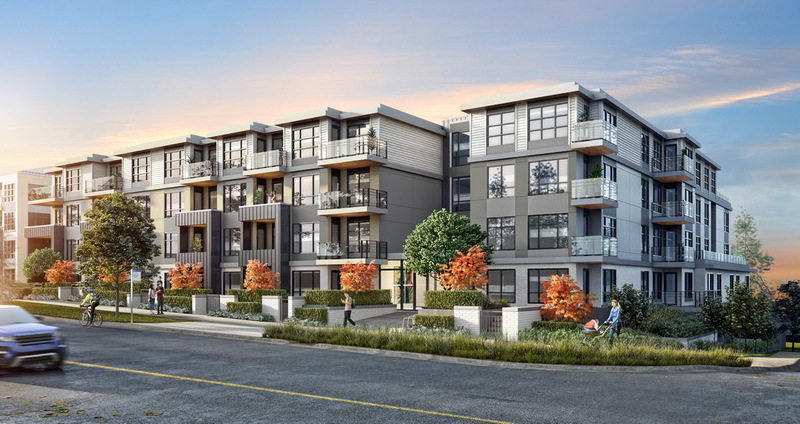 Condo sales in North Vancouver have increased by 27 per cent for a total of 135 sales in May, up from 106 sales in April, according to the Real Estate Board of Greater Vancouver (REBGV). Sales in Metro Vancouver are inching closer to the record-breaking pace of 2017 with only 405 less sales in May 2017 with 4,364 sales compared to May 2016 which had 4,769 sales. Last month was 23.7 per cent above the 10-year May sales average, the third highest sales for May on record. With 161 one, two, and three bedroom condominiums, garden homes and park-front townhomes, Green on Queensbury encompasses a rare mix of contemporary west coast architecture and natural beauty. The Qualex-Landmark™ group has more than a quarter of a century of residential and commercial development experience in the highly competitive British Columbia and Alberta markets. With accolades from customers and peers alike, they have earned a notable reputation for innovative and distinctive architecture, and take pride in creating thoughtful and enviable communities people are proud to call home. Some of the Qualex-Landmark™ group’s most notable projects in BC include District Crossing in North Vancouver; Pomaria, the 2007 winner of the Urban Development Institute’s Best High Rise Development award and the first LEED Certified multi-unit residential building in the City of Vancouver; and most recently ARIA, the group’s first LEED Certified purpose-built rental development in Vancouver’s Cambie neighbourhood and winner of the Urban Development Institute’s award for Best Multi-Family Rental in 2016. Green on Queensbury is the first large scale and fully parkside residential community to lay down its roots in the soon-to-be revitalized Moodyville neighbourhood in the City of North Vancouver. Spanning the entire 700 block of East 3rd Street at the foot of Queensbury Avenue, it will encompass a rare mix of contemporary west coast architecture and natural beauty with exceptionally-designed one, two, and three bedroom condos, garden homes and park-front townhomes. Green on Queensbury is the newest addition to the Qualex-Landmark™ group’s portfolio of award-winning communities.